Vancouver, BC - Aben Resources Ltd. (TSX-V: ABN) (OTCBB: ABNAF) (Frankfurt: E2L2) (the “Company”) is pleased to announce that they have received the 2018 exploration permit from the Government of Saskatchewan and has commenced mobilization for camp construction at their 4,656 hectare Chico Gold Project. The drill program, expected to begin on March 9th, will initially comprise 1200 metres in 4-5 drill holes with a provision to increase to 2000 metres should the proposed holes encounter significant mineralization as anticipated. The drill locations have been chosen based on strong coincident geophysical and geochemical anomalies within geologic units that are highly prospective for precious metal mineralization. A recently completed Induced Polarization (“I.P”) Geophysical Survey has revealed numerous high-priority drill targets including a strong and relatively shallow chargeability anomaly that has never been drill tested. 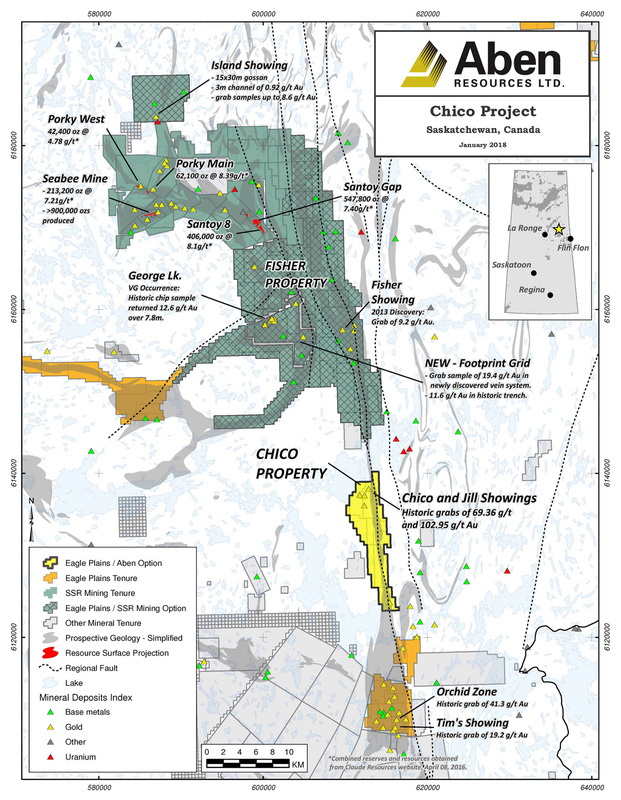 Chico drilling activity is expected to be conducted concurrently with a 10,000m winter drill program to be carried out by SSR Mining Inc. on the Fisher Property, located 6km north of Chico. Mineralized shear zones with quartz veining that define the Chico Zone are hosted in diorite and granite rocks, especially along the sheared contact between these two units. The Chico and adjacent parallel Ed and Western structural zones are splay structures related to the larger Tabbernor fault system. Despite the significant surface discoveries of gold along these structural trends, mineralization remains largely untested at depth and along strike extensions. The Tabbernor fault is a 1,500 kilometre-long regional structure which has been traced from as far north as the Rabbit Lake uranium mine in northern Saskatchewan to as far south as the 40-million-ounce Homestake gold deposit in South Dakota. The shared proximity to the Tabbernor structure and similarities in terms of age and tectonic history to the Homestake and Seabee/Santoy deposits was the main driving force behind Aben's interest in the Chico property. The SSR Mining Inc. (formerly Silver Standard Resources) nearby Seabee and Santoy deposits, located 40 kilometres to the north of Chico, have been in continuous production since 1991, producing 1.2 million ounces of gold from the two deposits. Aben Resources holds the exclusive right to earn an undivided 80-per-cent interest in the property by completing $3.5-million in exploration expenditures, issuing 2.5 million shares and making $150,000 in cash payments to Eagle Plains Resources (TSX-V: EPL) by 2020. Aben recently made a cash payment of $25,000 and issued 250,000 common shares to Eagle Plains, pursuant to the terms of the current option agreement. The 2017 geophysical survey has discovered a large high-chargeability zone centered below the middle portion of the Chico shear zone with some vertical chargeability structures extending upward from the root zone. The high-chargeability response may result from the presence of abundant sulfide minerals such as pyrite, pyrrhotite and chalcopyrite, which are closely associated with gold mineralization on the Property. The top of the root zone appears to extend to within 150 metres of the surface and represents an attractive and high-priority drill target given that multi-gram gold intercepts have been historically reported above and adjacent to it. Of the 22 historic drill holes located on the Property, the deepest has reached 110 metres vertical depth (157 metres down hole) and was not collared in this zone of high chargeability. Exploration programs in 2016 and 2017 involved systematic fieldwork including a 661 line-kilometre airborne magnetometer geophysical survey, mapping, trenching, soil geochemical analysis and the aforementioned ground-based IP-Resistivity-Magnetic survey. The systematic exploration has enabled field crews to identify mineralization, alteration and structural features similar to those at Seabee. High-grade gold mineralization at both Seabee and Santoy extends well below the shallow depths to which the Chico Project has thus far been explored. Trenching and drilling activities carried out by Corona Corporation and Cameco from 1988 to 1993 defined a mineralized strike length of over 1400 metres. Trenching by Corona at the Royex showing returned five chip samples greater than 1000 ppb gold with a best (chip) sample of 14.3 g/T gold over 1 metre (AR 63M06-0034). Follow-up diamond drilling by Cameco near the Royex trench returned five significant intercepts ranging from 0.51 g/T gold over 1.5 metres, to 36.3 g/T gold over 0.5 metres (AR 63M06-0041). Management cautions that past results or discoveries on proximate land are not necessarily indicative of the results that may be achieved on the subject properties. Aben has not been able to independently verify the methodology and results from historical work programs within the property boundaries. However, management believes that the historical work programs have been conducted in a professional manner and the quality of data and information produced from them are relevant.